As shared in our exclusive making-of interview, the documentary Our Man In Tehran came about by chance. When Elena approached Drew and then Ken with the idea of making a feature film they hadn’t even heard of Argo yet. 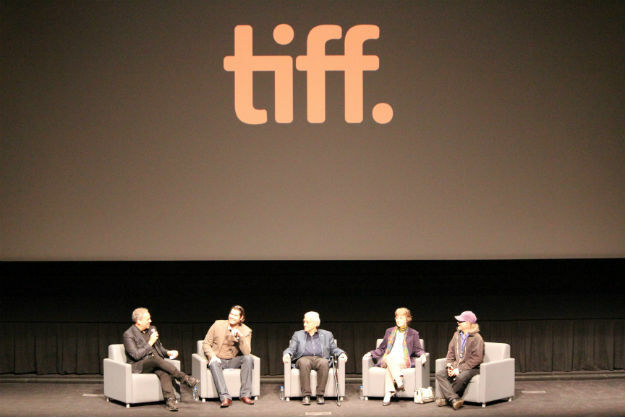 Suddenly Argo was debuting at TIFF and generating huge amounts of news and they feared for their project, that the Canadian story would be told. But then Argo screened and they realized that Canada’s actions had barely been mentioned and that the stories of our heroes needed to be shared now more than ever. But let’s be clear – Our Man In Tehran is not “the true story of Argo“. In fact they even went so far as to avoid even referencing Argo at all. 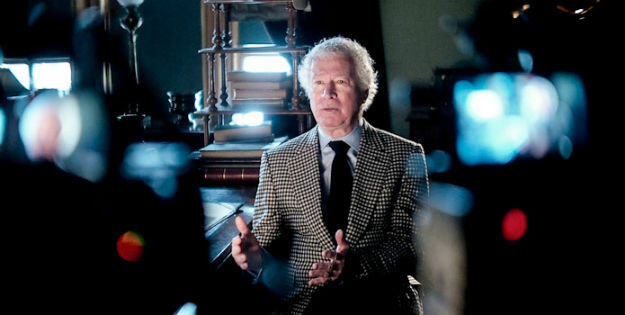 As co-director Larry Weinstein stated “We don’t want our movie to be a DVD featurette on theirs.” They completely acknowledge how Argo‘s existence can’t but help them in terms of marketing, but they didn’t want to date themselves by hitching to a Hollywood blockbuster that may be forgotten in a year’s time. Our Man In Tehran is meant to stand alone, and fortunately it does. 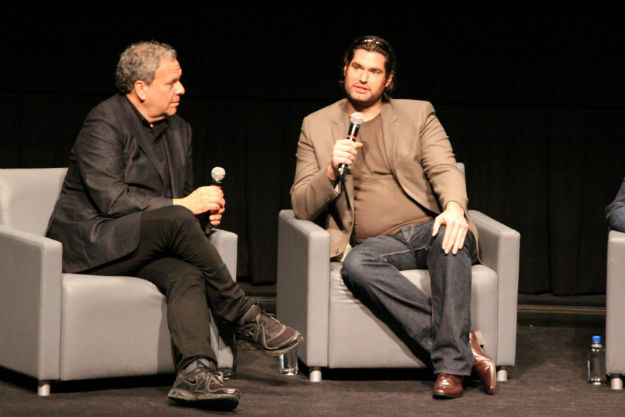 Our Man In Tehran, co-directed by Weinstein and Drew Taylor, is a documentary about the Canadian actions during the Iranian hostage crisis of 1979, and how Canada saved 6 Americans. The man in Tehran refers specifically to former Ambassador to Iran, Ken Taylor, dubbed as such by then-President Jimmy Carter. Carter’s administration and the CIA worked with Taylor and our government to exfiltrate 6 hidden American ‘house guests’ hiding with Canadian diplomats. The true circumstances of the rescue have only recently been declassified, and the parties involved are now able to discuss them. The events are re-told though a series of interviews with Ambassador Taylor, some of the rescued Americans, journalists, government officials, and a CIA agent that had been held and tortured with the larger group of hostages. Archival footage and some graphical representations fill in the gaps and a picture is painted for the viewer. Rather than beginning with the hostage-taking, the film goes back to the beginning of Iran’s social upheaval and the rivalry between the Shah and Ayatollah Khomeini, to allow those unfamiliar with (or too young to remember) the events to understand the build-up to the crisis. What could seem at first like a history lesson is instead filled with life as the individuals involved (including former Prime Minister Joe Clark) take the audience back with their recollections of the days. The interviews begin remotely, with cameras and boom mics visible, as if to demonstrate exactly how real these people are. But as the story deepens and the tension increases the camera closes in and you could be forgiven for forgetting that they all made it out alive. Argo was a very entertaining film and an enjoyable watch. But even though Ben Affleck never claimed to be telling the True story of the events, it is painful how little mention there is of what the Canadians truly did for the Americans. It went far beyond offering shelter, and at several steps there were errors made by the CIA that would have resulted in fatalities if the Canadians had not caught them. But this film is more than just an opportunity for Canada to pat itself on the back. It is an opportunity to sit back and view a volatile time in history, and reflect on how much or little things have changed. After a successful but small premier at TIFF 2013, the film is showing all week at the TIFF Bell Lightbox. On Friday September 20th it had a second premier at the Lightbox, which I attended. 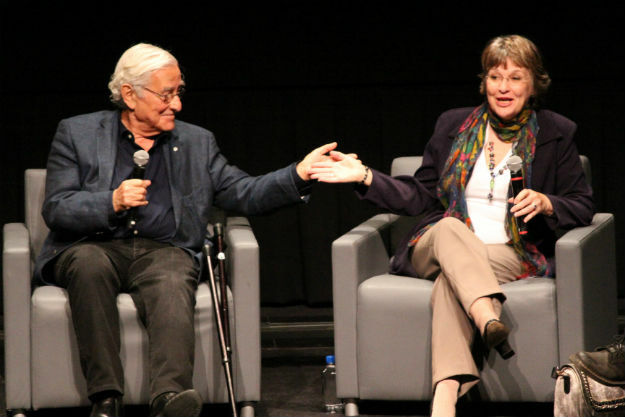 The event was noted as having a Q&A with Special Guests, but we were all amazed when Joe Schlesinger and Carole Jerome took the stage with Drew and Larry, after we had just seen them in the film. Joe is in his mid-80’s, but waved his walking sticks at us jauntily and was very engaged in the talk. It is clear that he and Carole have stayed in touch over the years and even took turns plugging their (sure to be amazing) books. Carole had discussed in the film how she had been one of the journalists traveling with Khomeni back to Iran, and she shared with us the process of having been selected for the journey (almost a lottery). And after the rescue had been revealed, she and some other journalists were faced with any angry mob upon leaving their hotel, with people shouting “Death to the CBC!”. In a delightful twist of fate they escaped by claiming to be from Irish TV. Our Man In Tehran has the fortune of telling a naturally compelling story, but it is also a strong film and one that I hope is viewed by many.